Clockwise, frae tap: Johannesburg Airt Gailerie, the Hillbrow skyline at nicht, Nelson Mandela Square in Sandton, Johannesburg CBD leukin east ower the M1 Freewey, the Varsity o the Witwatersrand's East Campus an Montecasino in Fourways. Johannesburg (Inglis: /dʒoʊˈhænɪsbɜrɡ/, Afrikaans: [joˈhɑnəsbʏrx]) forbye kent as Jozi, Jo'burg or eGoli, is the lairgest ceety in Sooth Africae. 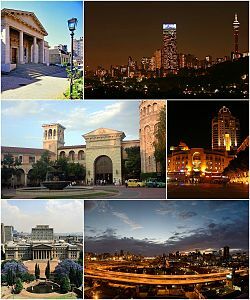 Johannesburg is the provincial caipital o Gauteng, the weelthiest province in Sooth Africae, haein the lairgest economy o ony metropolitan region in Sub-Saharan Africae. The ceety is ane o the 40 lairgest metropolitan auries in the warld, an is the warld's lairgest ceety that isna situatit on a river, loch, or coastline. While Johannesburg isnae offeecially ane o Sooth Africae's three caipital ceeties, it does hoose the Constitutional Court Sooth Africae's heichest court. The ceety is the source o a lairge-scale gowd an diamond trade, due tae its location on the mineral-rich Witwatersrand range o braes. Johannesburg is served bi O.R. Tambo Internaitional Airport, the lairgest an busiest airport in Africae an a gateway for internaitional air travel tae an frae the rest o soothren Africae. Mair recently, Lanseria Internaitional Airport haes stairtit internaitional flichts an is situatit conveniently on the conter side o the metropolis. Accordin tae the 2007 Community Survey, the population o the municipal ceety wis 3,888,180 an the population o the Greater Johannesburg Metropolitan Area wis 7,151,447. A braider definition o the Johannesburg metropolitan aurie, includin Ekhuruleni, the Wast Rand, Soweto an Lenasia, haes a population o 10,267,700. The municipal ceety's land aurie o 1,645 km2 (635 sq mi) is vera lairge whan compared tae ither ceeties, resultin in a moderate population density o 2,364 /km2 (6,120 /sq mi). Johannesburg includes Soweto, that wis a separate ceety frae the late 1970s til the 1990s. Oreeginally an acronym for "SOuth-WEstern TOwnships", Soweto oreeginatit as a collection o settlements outby fae Johannesburg populatit maistly bi native African wirkers in the gowd minin industry. Eventually incorporatit intae Johannesburg, the apartheid regime (in pouer 1949–1994) separatit Soweto frae the rest o Johannesburg for tae mak it a complete Black aurie. Lenasie is nou pairt o Johannesburg an aw an is an aurie predominantly populatit bi those o Indian ethnicity syne the apartheid era. Gauteng is grawin rapidly due tae mass urbanisation that is a feature o mony developin kintras. Accordin tae the State o the Ceeties Report, the urban portion o Gauteng comprisin primarily the ceeties o Johannesburg, Ekurhuleni (the East Rand) an Tshwane (greater Pretoria) will be a polycentric urban region wi a projectit population o some 14.6 million fowk bi 2015. ↑ "Johannesburg (South Africa)". Crwflags.com. Retrieved 9 December 2010. ↑ 3.0 3.1 3.2 3.3 "Main Place Johannesburg". Census 2011. ↑ "The World's Cities in 2016" (PDF). United Nations. 2016. p. 11. ↑ "Gauteng's Human Development Index" (PDF). Gauteng City-Region Observatory. 2013. p. 1. Archived frae the oreeginal (PDF) on 11 January 2015. Retrieved 1 January 2015. ↑ 6.0 6.1 "Global city GDP 2014". Brookings Institution. Archived frae the oreeginal on 4 June 2013. Retrieved 18 November 2014. ↑ &Copy; Th. Brinkhoff (2010-01-23). "Principal Agglomerations of the World". Citypopulation.de. Retrieved 2010-07-02. ↑ "Johannesburg". Southafrica.to. Retrieved 2010-07-02. ↑ "Twinning agreements". Making Joburg an entry point into Africa. City of Johannesburg. Retrieved 28 August 2009. Wikimedia Commons haes media relatit tae Johannesburg. This page wis last eeditit on 13 Februar 2018, at 22:02.